Berkeley-based jewelry designer Wilfy MacManus lends a special touch to each piece he creates. His jewelry collection showcases a lifelong interest in Celtic design, an artist's eye, and a tradition of excellence passed down from previous generations. After studying design at the University of Ulster (Belfast Art College), he taught at the Open University, and then moved to the US to continue his education and to teach. Together with friend Jeff Taylor, who Wilfy affectionately calls 'one hell of a craftsman,' he eventually started the Celtic jewelry company called MacManus and Taylor, known largely for its work throughout the Renaissance Faire both in Northern and Southern California. The company later became named MacManus and Sons. In 1997, Wilfy opened Celtic Inheritance on Berkeley's Shattuck Avenue. The store exclusively features MacManus and Sons Celtic handmade jewelry along with other unique gifts and jewelry with a Celtic theme. The majority of his pieces ar first fabricated molded, and then cast, a process which produces a high quality yet reasonably priced article. 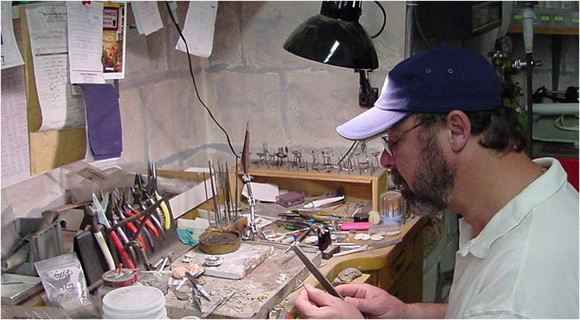 Wilfy specializes in custom fabricated designs made from silver, gold and platinum.